The production of advanced high-strength steel (AHSS) requires rapid cooling, which results in undesirable flatness and/or excessive residual stress of products. Those defects cause adverse effects to automobile production processes. Therefore, high-performance levelers are required for eliminating those defects. 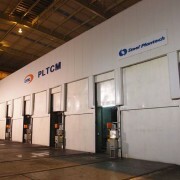 JP Steel Plantech Co. has developed a new tension leveler to meet market demands. This tension leveler has been operating since October 2014 with excellent performance to produce high-grade AHSS as expected with the customer’s satisfaction. This paper discusses the new tension leveler. 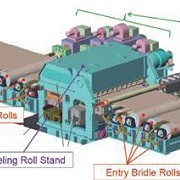 A reversing cold rolling mill has been suffering from such drawbacks as unrolled portions necessarily produced in head and tail ends reduce yield, and time consuming works including removing of coils, threading of the strip and holding of the strip with the tension reel, which result in decreasing productivity. 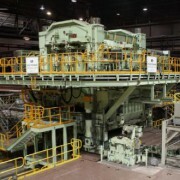 There has been developed a new rolling method and facility (Zoom-Mill™, Zero-Oriented Off-gauge Minimization) that allows a leader strip and a product coil are connected using a spot welding machine and are finished through even-number passes in a reversing cold rolling mill. It is expected to reduce unrolled portions (improvement of yield) as well as improvement of productivity. The first Zoom-Mill™ was put into practical use and commercial operation started in March 2010. This mill is working very well as intended initially, achieving approximately 1% improvement of product yield of the products immediately after commencement of operation. Productivity of the mill was also sharply increased along quick learning curve. 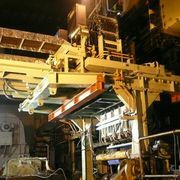 The New Heat Treat Leveler for ArcelorMittal Burns Harbor (AMBH) was installed as one of the key components of the modernization of the plate quenching /tempering facility and has been in operation since April 2012. The design of the leveler is the 4th generation plate roller leveler (SuPerLevelerTM) which has the infinite rigidity control system and also has special feature to cover all the high tensile and heavy gauge products of heat treatment facility in Burns Harbor. Herewith JP Steel Plantech Co. (SPCO) introduce the leveler as a machine builder. Commercial operation of the PL-TCM for CSVC in Vietnam involving SPEOS™ technology to all 6-Hi stands has started up successfully in November 2013. The descriptions as shown on this paper are the outline and technical high-lights of the PL-TCM.